Manufacturer & Exporter of English Cursive Handwriting Improvement Books. Our product range also comprises of Abacus Books, Abacus Study Material and Abacus Bags. Backed by a team of creative and experienced professionals, we are engaged in providing English Cursive Handwriting Improvement Books. 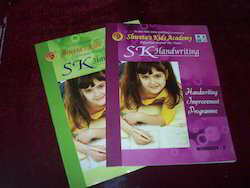 Our Handwriting Improvement books are specially designed for everyone above eight years. It is specialized in training and teaching of Handwriting for the one who really want their handwriting to be good. Our handwriting can also reveal a chunk of our character, thought and emotional well being.